Resembling a fortress, the Eastern Orthodox Monastery of Arkadi served as an important site of Cretan resistance against the Ottoman rule. During the Cretan revolt of 1866, women, the elderly, and children sought refuge from battle in the monastery's powder room. When the Ottomans reached the powder room, the hidden Cretans lit the gunpowder, killing themselves, as well as many Turkish soldiers. Explore this important national site and admire the varied architecture of the complex. Make sure to spend time in the 16th century church. The striking construction was heavily influenced by Renaissance art. Take care to be respectful of the many pilgrims who come here for spiritual reasons. 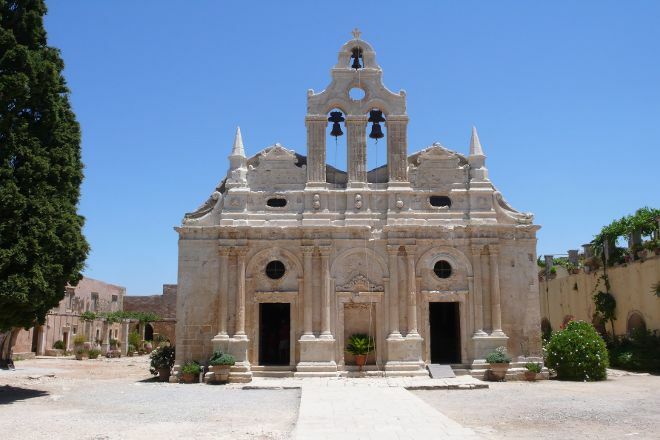 Use our Rethymnon trip planner to add Monastery of Arkadi and other attractions to your Rethymnon vacation plans. Steeped in its past, it embodies some of the painful history of Crete. High symbolic place, it feels like a real emotion and feels invade of recollection. This is probably one of the nicest monasteries we've visited in Crete. You are able to view almost everything there unlike some where access is greatly restricted. Some great historical features and plenty of photo opportunities. You even get to see stories in the trees alongside if you are lucky. It gets very hot up in the mountains so I'd suggest you visit early, doing which also means you will probably miss the influx of tourist coaches. Beautiful place to visit with great significance to the Greek nation. According to the history during Cretan resistance of Ottoman rule, 943 Greeks, mostly women and children, sought refuge in the monastery. After three days of battle the Cretans blew up barrels of gunpowder, choosing to sacrifice themselves rather than surrender. I believe that the history of the place should be hightlighed in more detail for the visitors. Nowadays, 3 monks live there and take care of the place. Great architecture influenced by the Renaissance. 3 euros per person. Interesting to walk around. Mostly fun exploring the architecture. Very cool area showing all the gold woven religious artifacts. This is a very quiet and nice place. There's a church with nice paintings and also buildings around which were used by the monks You can visit all. It's also nice to go there because you are some kilometers inside the island and landscapes are different. This is a great spiritual place and is worth visiting. For 3 € per person it's well worth it If you travel by car. Not sure how how it works if buy an excursion since there were four us. Every day, we help thousands of travelers plan great vacations. Here are some tips on how to use your Listing Page to attract more travelers to your business - Monastery of Arkadi. Promote your permanent link - https://www.inspirock.com/greece/rethymnon/monastery-of-arkadi-a268854595 - on your website, your blog, and social media. When a traveler builds a plan from this page, the itinerary automatically includes Monastery of Arkadi. This is a great way for travelers looking for a great vacation in your city or country to also experience Monastery of Arkadi. Promoting your link also lets your audience know that you are featured on a rapidly growing travel site. 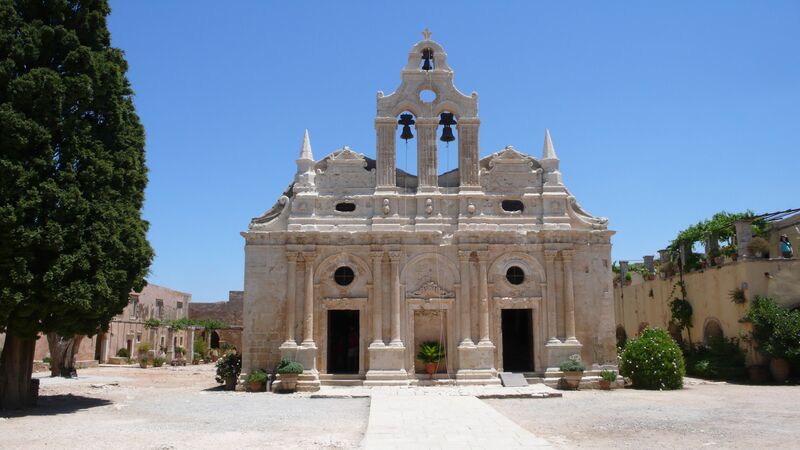 In addition, the more this page is used, the more we will promote Monastery of Arkadi to other Inspirock users. For best results, use the customized Trip Planning Widget for Monastery of Arkadi on your website. It has all the advantages mentioned above, plus users to your site can conveniently access it directly on your site. Visitors to your site will appreciate you offering them help with planning their vacation. Setting this up takes just a few minutes - Click here for instructions.